Although my first attempt at a ‘proper’ all-grain home brewed beer wasn’t perfect, I was inspired and encouraged by how well it came out. The extra work – mashing and the longer boil – really hadn’t made things any harder, just more long winded. 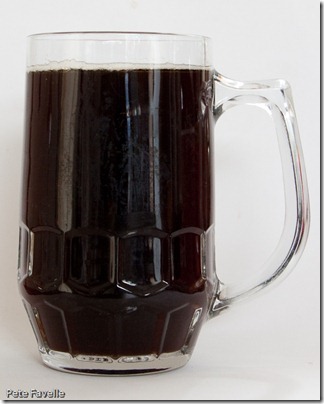 My next beer had to be something dark and festive, as I hoped it would be ready just in time for Christmas. I wasn’t getting very far with finding an interesting recipe so I decided to throw caution to the wind and invent my own. You might think this sounds somewhere between hubris and insanity and you’d probably be right. But in a way, this is the whole point of messing about with the all-grain brewing nonsense – you can do whatever you want and all it costs you is a day of brewing and a few quid in grain. I’m not, however, completely mad. I found some fairly generic dark mild recipes and grabbed a copy of the Beer Engine. If you have any interest in home brewing, this is well worth the download; it lets you feed in the ingredients and tinker with the proportions, showing you just what affect it will have on the final beer. I have no idea how accurate it is, but it’s a fantastic confidence booster if nothing else. Once I had decided on my base beer, I did some more reading, put together my spice list and agonised over what proportions of each to use and when to add them to the mix. I wanted something almost gingerbread-like, although it didn’t exactly turn out that way. So here’s my final recipe. As before, the mash and the boil were both 90 minutes. The ingredients below were added for the last 15 minutes of the boil. This time around I tried some rudimentary water treatment, in that I boiled up my water the night before to drive off the worst of the water hardness. Other than that it was exactly the same as last time, although I started a lot later in the day so I wasn’t actually pitching the yeast (another packet of S-04) until midnight! After seven days, the damn fermentation had stuck again, at 1021. Rather than stressing myself or messing about with it, I just gave in and put it into my pressure barrel, and left it well alone to sort itself out for a month. After that time, I bottled it. This time, I dared to prime the bottles with a half teaspoon of sugar in each; if anything that’s slightly under, but there’s definitely some pressure in the bottles now. But the real question is, how did it turn out?! Well, it’s a satisfyingly deep, reddish brown in the glass. The priming has partially worked and there’s a thin fine bubbled head although it’s not very long lasting – I need to do a little more work on that side of things. The nose is full of spices; cloves and a hint of nutmeg, with some sweet notes from the honey too. Kavey took one whiff and immediately labelled it as Sarsaparilla and I have to admit she’s right. Those spicy notes sadly drown out the underlying beer aroma, but on the upside there is no hint of that homebrew tang. Result! In the mouth, those winter spices are still strongly in evidence. The sweetness is less apparent but the malt comes through nicely – it tastes like a proper beer! However, there’s a slight bitter undercurrent which is maybe as much from the ginger as from the hops, and which lingers slightly longer than I’d like. The body is lighter than I wanted but is not too watery. So, not perfect but pretty damn good for a first attempt. It’s a beer I can be properly proud of! Edit 08/04/2012: As mentioned here, I recently discovered an error in the way I was testing and the beer was in fact fully fermented.